According to CNN, the Indonesian government has ordered all International NGO offices to close operations and leave West Papua by the end of 2015. They apparently received these instructions from the state earlier this month. This is a familiar story in West Papua as many NGOs have already been made to leave, including the International Committee of the Red Cross (ICRC) in 2009, the Catholic Organisation for Relief and Development Aid (CORDAID) in 2010, and Peace Brigades International (PBI) in 2011. It appears that now the Indonesian government is forcing all remaining International NGOs, including Oxfam to leave. A crackdown on NGOs in West Papua comes as part of the ongoing blackout inside the country. Last month, Human Rights Watch published a comprehensive 73 Page report slamming the Indonesian government for the continued lack of media access for foreign journalists in West Papua, despite promises by Indonesian president Joko Widodo. 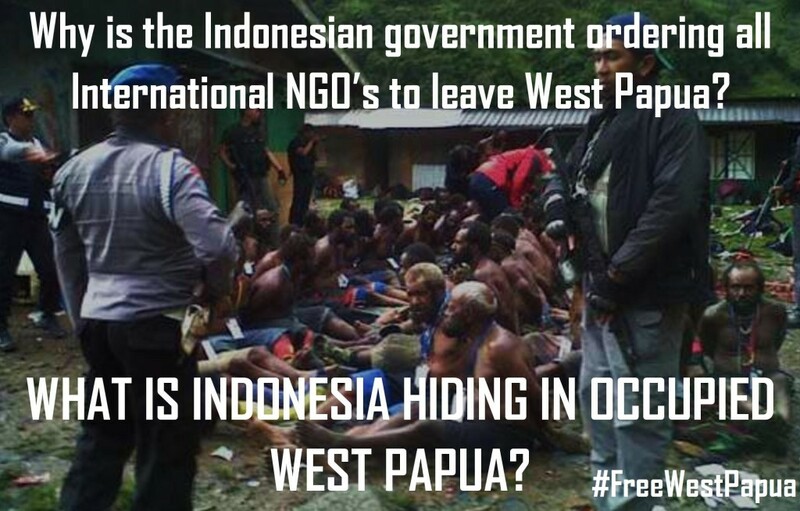 If all International NGO offices really have been ordered to leave West Papua then this should be fully condemned. Clearly the Indonesian government is trying to hide the truth about what is really going on in West Papua and this latest move is anther example of the extreme measures being done to prevent the International Community from finding out the truth and helping the people of West Papua. Perhaps the Indonesian government is especially worried about the Human Rights Fact Finding Mission to West Papua being organised by the Pacific Islands Forum will uncover more of the human rights atrocities still being committed. If as Indonesian President Joko Widodo claims, “there is nothing to hide” in West Papua, why are foreign journalists, human rights monitors and NGOs being kicked out and barred from going there? The truth must be exposed.